Ebony Cool Cat, a lovely black American Quarter Horse mare. 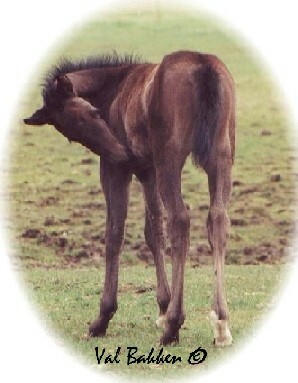 As a foal she was lighter, getting blacker as she matured (see next photo). Ebony's sire was Jaz Cool Cat, also a black, her mother was chestnut. Thanks to Val Bakken of Sage Ridge Quarter Horses, who took this photo, and who was the owner of Ebony at the time.